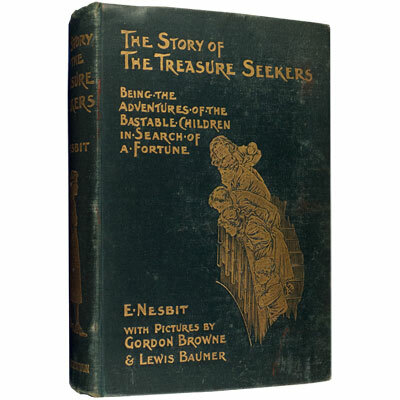 The Story of the Treasure Seekers. Being the Adventures of the Bastable Children in Search of a Fortune. - Edith Nesbit, Gordon Brown and Lewis Baumer (illustrators) 1899 - T. Fisher Unwin, London - First Edition	A lovely unrestored and unfoxed first edition of Edith Nesbit’s first book. Illustrated with seventeen full page black and white plates. The messages intertwined amongst the various adventures make this a book that adults may actually find more entertaining than they expected, especially if read previously as a child. “Edith Nesbit [1858-1924], was a mischievous, tomboyish child who grew up to be an unconventional adult. She and her husband were founder members of the socialist Fabian Society and their home became a centre for socialist and literary discussion. Their friends included some of the time’s greatest writers and thinkers, including George Bernard Shaw and H. G. Wells. Everything about Edith showed her as a woman trying to break out of the mould demanded by English society at the time – she expressed her individuality through her clothes, hairstyle, lifestyle and her habit of speaking forcefully on almost any subject. She lived her socialism and late in life her charitable deeds brought her close to bankruptcy. E. Nesbit – she always used the plain initial for her writing and was sometimes thought to be a man – started to write for children after years of successful writing for adult magazines. She was asked to write about her childhood but instead of facts chose to describe her happy girlhood in fiction. The result was books still read today, firm best sellers for decades. She was brilliant at combining real-life situations with elements of fantasy and humour.” – Heidi Green, William Morrow.